Peptide (C)TTKINMDDLQPSENEDKS, corresponding to amino acid residues 848-865 of rat CaV1.2 (Accession P22002). Intracellular loop between domains II and III. Homology Mouse - identical; guinea pig - 17/18 amino acid residues identical; human, rabbit - 16/18 amino acid residues identical. Standard quality control of each lot Western blot analysis (unlabeled antibody, #ACC-003), and immunohistochemistry (labeled antibody). Immunohistochemical staining of rat cerebellum frozen sections with Anti-CaV1.2 (CACNA1C)-ATTO-488 Antibody (#ACC-003-AG), (1:100). 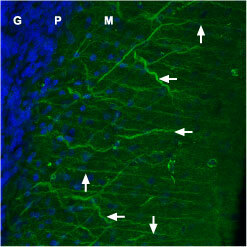 Both dendrites of Purkinje cells (horizontal arrows) and fibers of Bergmann glia (vertical arrows) were stained. DAPI (blue Nissl counterstain) helps define the layers: granule (G), Purkinje (P) and molecular (M). Immunohistochemical staining of paraffin embedded sections of rat pancreas using Anti-CaV1.2 (CACNA1C)-ATTO-488 Antibody (#ACC-003-AG), (1:50). Staining is highly specific for endocrine cells of the Isle of Langerhans (IL). Immunocytochemical staining of MS1 cells. A. Intracellular staining of paraformaldehyde-fixed and permeabilized MS1 cells with Anti-CaV1.2 (CACNA1C)-ATTO-488 Antibody (#ACC-003-AG), (1:50). B. 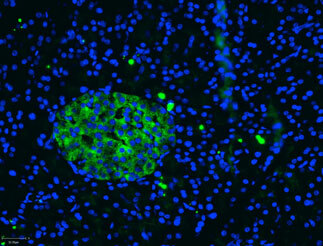 The cell-permeable dye Hoechst 33342 (blue) was used for nuclear staining. C. Merged image of panels A and B.
Allard, B. et al. (2000) J. Biol. Chem. 275. 25556. Anti-CaV1.2 (CACNA1C) Antibody (#ACC-003) is a highly specific antibody directed against an epitope of rat CaV1.2 channel. The antibody can be used in western blot, immunoprecipitation, immunohistochemistry, immunocytochemistry, and indirect flow cytometry applications. It has been designed to recognize CaV1.2 from mouse, rat, and human samples. Anti-CaV1.2 (CACNA1C)-ATTO-488 Antibody (#ACC-003-AG) is directly labeled with an ATTO-488 fluorescent dye. ATTO dyes are characterized by strong absorption (high extinction coefficient), high fluorescence quantum yield, and high photo-stability. The ATTO-488 label is analogous to fluorescein isothiocyanate (FITC) and can be used with filters typically used to detect FITC. Anti-CaV1.2 (CACNA1C)-ATTO-488 Antibody has been tested in immunohistochemical and immunocytochemical applications and is especially suited for experiments requiring simultaneous labeling of different markers. Anti-CaV1.2 (CACNA1C) Antibody (#ACC-003) for western blot analysis. This antibody recognizes the CaV1.2a splice variant and thus can also be used as a control for detecting CaV1.2. Anti-Human CaV1.2 (CACNA1C) Antibody (#ACC-022). This antibody recognizes a different epitope and thus can also be used as a control for detecting CaV1.2. CaV1.2 (CACNA1C) Channel Overexpressed Membrane Fractions (#LX-104) are Xenopus oocyte membrane fractions overexpressing the CaV1.2 channel. CaV1.2 (CACNA1C) Channel Antibody and Membrane Fractions Kit (#LK-104C). This kit includes the CaV1.2 membrane lysate, and Anti-CaV1.2 (CACNA1C) Antibody (#AGP-001). Guinea pig Anti-CaV1.2 (CACNA1C) Antibody (#AGP-001) is raised in guinea pig and can be used in immuno-colocalization studies in conjunction with any of our antibodies raised in rabbit. This antibody has been raised against the same epitope as Anti-CaV1.2 (CACNA1C) Antibody (#ACC-003).